With Pyjamas through a whiff of grapeshot! : Chain of Command with "The Man who would be King"
Some lovely Warlord Games Germans make their way along the hedge row. How's that for a strange blog entry heading? No, the title does not mean that we have suddenly merged a great set of WW2 rules with a fine Colonial volume to create a mish-mash of periods etc. My oldest son Ben and I have been very much enjoying revisiting some old YouTube videos of Richard Clarke and others playing through some scenarios of Chain of Command and it has very much reinvigorated our desire to play a few more games. Now that Ben is at University and its no longer technically a school day on the Thursday, we decided to dust off the figures and have a crack at the club in North Perth. The game was set as an encounter battle with the US force on the attack and the Germans looking at fighting a delaying action to allow for hypothetical reinforcements to arrive. amateur efforts as the rustiness showed. Another angle down the table before any troops have deployed. On the other flank the grisly old Platoon Sergeant looks to scout the area. Touching History fame. In fact these lads played a starring role in his WW2 publication. I deploy the .30 calibre mounted MMG as the Germans appear. The section looks to make its way around the woods to take the Germans in the flank. Overwatch is a great order to give troops when you are a bit unsure of what may await on the other side. Whilst I used my "Support Points" on the MMG, Ben decided to grab an unarmed Half-track to mount a section in. The section that has been receiving fire from the MMG is assaulted through the opening to the field. It gets very ugly for the Germans very quickly. Another view of the assault just to annoy Ben! by rallying shock points off them sufficiently to still operate effectively. It was a fun game that we both enjoyed and admittedly, played pretty averagely from a tactical perspective. However it was great to play the game with the, as Von Peter would call the first born, "Son and Heir" at the club on a weeknight and share a beer with him at the same time. Thank you very much Serguiss. Ben and I enjoyed the game very much however as I mentioned in the post, our tactics and play was sub-par and our rusty rules based decisions were average. However, in the best wargaming spirit, we had a very good time! Just keep the faith Stew and it will all work out well in the end. You’ll be charging your Regiments across the fields when your child is an adult and laughing as they decimate your best laid plans with typical flukey dice rolls! Don't know anything about these rules but you certainly present a very nice looking WW2 game, as usual. Thank you Chris. 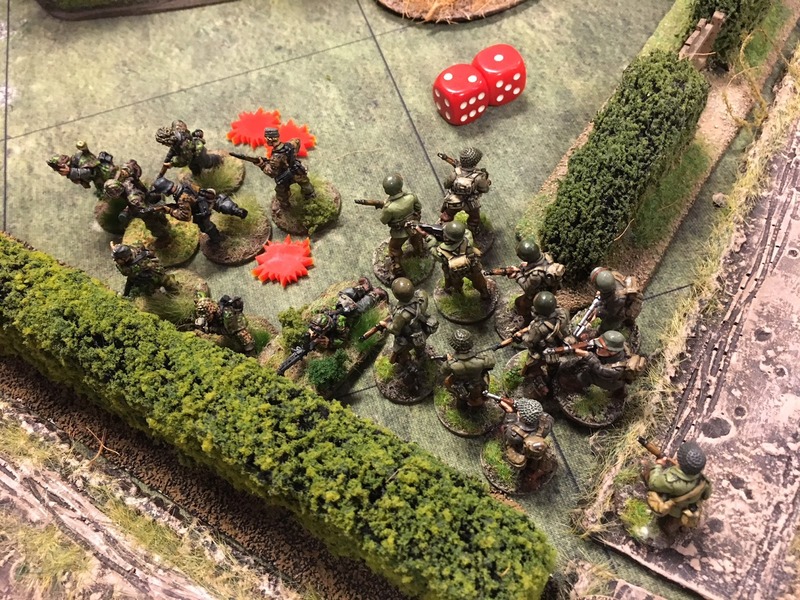 A set of rules from the Too Fat Lardies stable and once again a cracking set of rules for skirmishing WW2 at a platoon level. They have a bigger version that can involve company plus battalion assets which is also a lot of fun. Certainly did Peter - great to have a game with the sons whenever I get the chance.